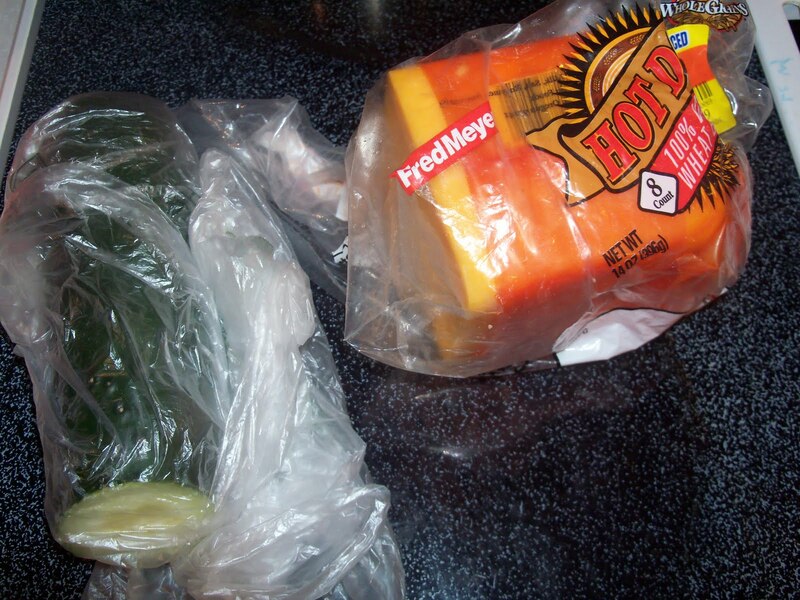 A Resourceful Home .com: Who needs Ziplocs? In our recent extreme frugality I ran out of gallon ziploc bags. I elected not to replace them because I found they weren't a necessity and those few bucks would be better spent elsewhere. Then we ran out of fold-top sandwich bags. This was inconvenient, but again, I decided we could wait to purchase them and added them to my "buy in Oregon" list so I could save sales tax. Then I ran out of the gallon 'storage bags' which don't have a closure, but are nice big, clear bags. Same story - didn't replace them. So what to do almost no plastic bags? We made do and I've been having such a fun time figuring out creative solutions I might not buy more plastic bags for a good, long while. The biggest challenge right away was how to pack DH's lunch. I generally send him with leftovers in a plastic container, a piece of fruit or yogurt, and a treat. But sometimes I send a sandwich and what do you do when there's no sandwich bags left? Enter MamaLuvs, these great little bags a friend of mine makes. I won these as a prize at MOPS this year and hadn't even tried the sandwich bag. This big bag is a sandwich, the small bag is 3 cookies, and the grapes are in a recycled produce bag. Check out MamaLuvs here - a great product that's great for the environment. The next challenge was keeping food covered in the fridge. I used to toss things in sandwich bags or ziplocs (depending on their size), but I was out of both. I quickly started noticing how many plastic bags come through my kitchen - constantly! I had been busy patting myself on the back because I always use my grocery totes and almost never have those irritating grocery sacks anymore, but in reality I am bringing home tons of plastic in packaging! Here you can see a recycled bread bag for the cheese block and another produce sack for the cucumber. Since I realized the amount of plastic I've been bringing home I've cut down at the grocery store, too. For example, if I'm buying two oranges, I just put the oranges in the cart without a bag. Same with cucumbers, bell peppers, lemons, limes, & kiwi. These are things I usually only buy 1 or 2 of so I just skip the bag. Finally, and this is my favorite, I've been using cereal bags! These bags are durable and I love using some of that extra packaging. 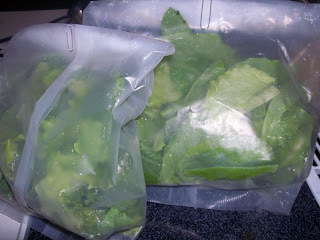 Here is some lettuce I've packaged up to give away. Rather than use a gallon ziploc (like I did last year), I just put the lettuce in these bags and fold the top down. Voila! Another great bag is the tall, thin newspaper sack. I don't like to use these for food because of the newsprint, but they are awesome for diapers. I also realzed that the tortillas we buy come in a ziploc bag so I rinsed one and used it as part of sorting & organizing Joanna's closet. 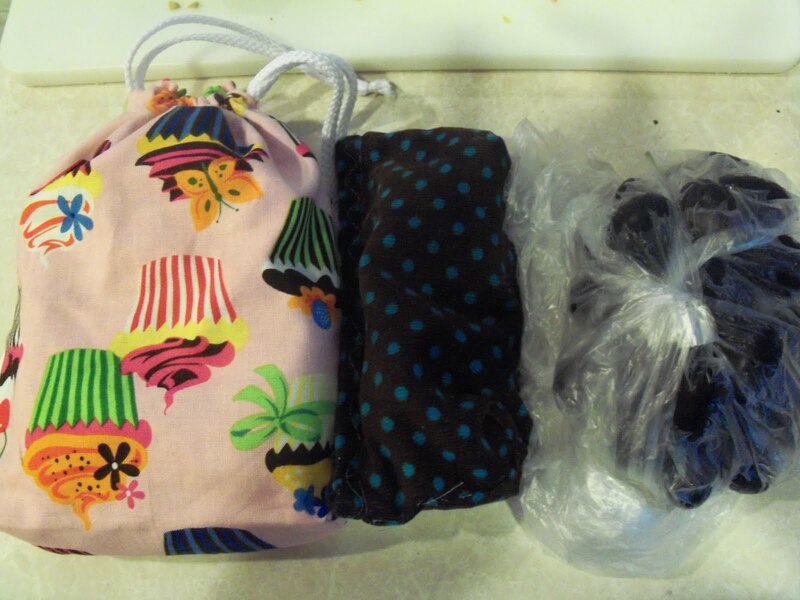 The most common bags I've been using are bread, bun, & bagel bags - all you have to do is shake out the crumbs. I also use a lot of the produce bags because they're versatile and even cutting down, I come home with at least two each week. Do you have any other good ideas for not using plastic bags or recycling the plastic bags you have? I love that DH's sandwich is in a pink bag with cupcakes, flowers and butterflies!